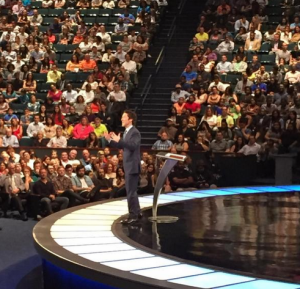 Amid all the chaos, Joel Osteen stood strong while hecklers interrupted his Sunday morning service held at his Lakewood Church in Houston, the Blaze reports. As words like “You’re a liar!” were spewed throughout the church, Osteen thanked his fellow church-goers for their patience. Sportswriter Anwar Richardson, who was visiting Osteen’s church, documented Sunday’s events on his Twitter account. In total, six hecklers were escorted out of the church and charged with criminal trespassing.